I can’t wait to cook these pancakes in our Airstream one day. 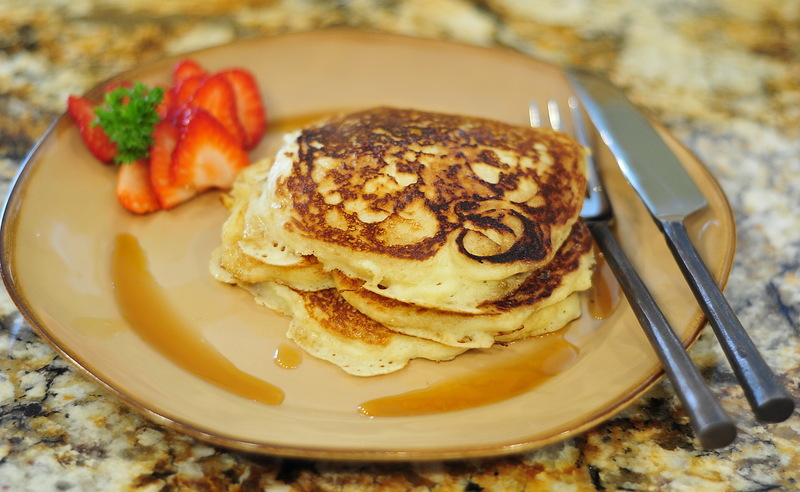 I have to say, these are the best pancakes that Hubs and I have ever tasted! Plus, this is my first attempt at photographing food. I’m normally out photographing Bison, Moose or Big Horn Sheep. Pancakes just sit there so I guess, it’s easier~Not!!! Lots to learn in the world of food photography but, here is my first shot. I have been so inspired by my new friend, Monica Bennett. Monica is an artist not only of food photography but, all things culinary and graphic design. She is incredibly talented, uber sweet and I’m honored to know her. If you have a free moment, please check out Monica’s blog. And oh yes, she owns an Airstream! The key to fluffy pancakes is not to overmix the batter; it should not be beaten smooth. Heat griddle to 375 degrees. Whisk together flour, baking powder, baking soda, salt, and sugar in a medium bowl. Add eggs, buttermilk, and 4 tablespoons butter; whisk to combine. Batter should have small to medium lumps. Heat oven to 175 degrees. Test griddle by sprinkling a few drops of water on it. If water bounces and spatters off griddle, it is hot enough. Using a pastry brush, brush remaining 1/2 teaspoon of butter or reserved bacon fat onto griddle. Wipe off excess. Using a 4-ounce ladle, about 1/2 cup, pour pancake batter, in pools 2 inches away from one other. When pancakes have bubbles on top and are slightly dry around edges, about 2 1/2 minutes, flip over. Cook until golden on bottom, about 1 minute. Repeat with remaining batter, keeping finished pancakes on a heatproof plate in oven. Serve warm.